Think of a place where you experienced the greatest sense of aliveness, vitality and belonging ? How has this connection to a place inspired how you think of how you belong to your community now? What makes a place, a place? Whether it is in nature, our built environment, community or language and arts, in its presence we feel more at home and more like ourselves. Place speaks to us in some important way about the central themes and aspirations in our lives. And particularly it brings to life those illusive qualities of authenticity, creativity and spontaneity that we most value in ourselves but which are sometimes difficult to connect with when we spend too much of our time in surroundings that don’t feel right or very vital and alive. From our earliest days, being deeply connected to a place in our physical environment or the imagination has instructed us in how we engage our world. Through the symbols, stories, metaphors and images with which we hold and describe the power of place, the future touches us, awakens our heart, enlivens our senses and attracts us ever more fully into life. Although much has been discovered and shared about the style, issues and processes of leadership, the significance of place as a source of inspiration and the container in which we bring people together to do their best work has rarely been fully appreciated. For example, when a group of community leaders in Atlantic Canada were asked about what the soul of place meant for them they reflected on finding common ground in their deep ties to land and sea – to a mist filled land both gentle and unyielding and to the enduring loyalty to their stories and community. This long history of living on a sea bound coast gave them the gift of a perspective larger than any one person or any individual’s self interest. For a local Chippewa First Nations community near Orillia, Ontario the defining narrative of place is that their land sits on the confluence of two distinct biospheres, where the Canadian Shield to the north meets the limestone plain to the south running from Georgian Bay and following the south edge of the shield to Kingston Ontario. This is The Land Between and their stories are about living in a meeting place where they needed to discover the best of these two worlds. Similarly, when I asked a group of leaders at Quaker Foods about the significance of place, they found sustenance in their company heritage story and were able to draw on the gifts from its past. Their story had its roots in the founding narrative of their first manufacturing plant in Cedar Rapids, Iowa, and the American heartland. The heartland tale carried a powerful image and association with dedicated work, a sense of integrity, cooperation and self-reliance. Too often we attempt to undertake large systemic transformational changes without taking into account the unique characteristics of the place that we are engaged with. Most communities are not at a loss for innovative ideas. What they may overlook however is how to partner with these unique qualities and features of the place they are in- the soil they inhabit – that enable these seeds of innovation to take root and grow. This is the promise of place, the invitation to come into an alignment and harmony with our own inner music. This sensation of ‘at homeness’ in the world connects us to the unique and exquisite trajectory of ones’ own work and life. 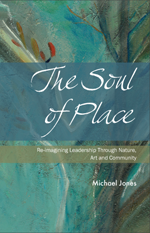 As we actively engage with place, we experience being witness to and participants in the furthering of this connectedness and with the entire complex web of life. That is we discover that place is not only a destination we seek or desire to return to – all places are fleeting – but also a presence we grow out from. In times when everything around us begins to look the same and we are led to believe that there is no such thing a place any longer – we need to re-align around the more hopeful perspective. A perspective that says that whoever we are and wherever we have come from – our primary work now as leaders and communities is to tap into the deep generative power of place by taking up the work of being place–makers. When we engage with place we are also acted on by a place. So as place-makers our primary work is to ensure that each place we steward is free to express itself, as itself, through our work as leaders and in communities, in a manner that is true to its own deepest nature. These insights set the context for a forum on Place Based Leadership and Transformational Change co hosted by Fetzer Institute-funded, Powers of Place Initiative and Banff Centre Leadership Development. The forum was an opportunity to come together to explore how our surroundings – nature, art, community and our built environment – can partner with us as leaders to inspire and revitalize our leadership practice as well as our organizations and communities. More specifically the forum hoped to create experiences that would help build a language for leaders who wish to utilize the soul of place in their transformational leadership work. It also sought to create a path forward for engaging communities in their thinking about place and how it can transform their leadership and their environments. Some of the realizations that came from these Banff dialogues on place-based leadership were that place itself is alive in our surroundings and in us and serves as a sanctuary and source of belonging comfort and home in an uncertain world. Another is how the mystery of place keeps hope and possibility alive. A third is how place teaches us about love- and particularly about how to love something so deeply that we learn to love other – perhaps lesser things – later on. A fourth and perhaps the most profound realization is how through place we learn to make a home for ourselves in the world. That rather than being separate and alien – the world is an intimate part of us just as we are an intimate part of it. By looking at place not only as something to return to but also something to grow out from –orienting us to the future and not only the past; and by realizing that a place is not an object or a thing, but a power and a presence, we can partner with place in a way that is itself deeply transformative, opening our hearts to the experience of beauty, aliveness and possibility. This entry was posted in Placebased Leadership and tagged belonging, homecoming. Bookmark the permalink.